For those who’ve been driving along 9W the last few years wondering and anticipating the next restaurant in the Mama Mexico space will have to wait a little longer (presumably till next year). 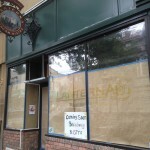 However construction has been going on for a few weeks and a sign was raised the other day for Amore Tuscan Grille. There are no other specifics yet for the Italian restaurant, but stay tuned as we’ll post any info when it becomes available.